On the eve of Britain’s general election, the Bank of England (BoE) quietly announced its data documenting UK debt sales to foreign investors had been overstated by 200 percent for the past eight weeks. The central bank sent shockwaves through the City of London on Wednesday when it made the admission. Its disclosure, revealed in a formal “notice of errata,” proves a serious embarrassment for the bank. It also rubbishes figures BoE officials released on May 1, indicating foreign investors had purchased UK debt at a record rate in March. Having rectified the errors, the BoE revealed overseas sales of UK debt in March did not reach a record £28.2 billion as originally thought but rather stood at a more modest £14.8 billion. The error was reportedly caused by inaccurate figures for the month of February, which reported sales of UK debt amounting to £7.6 billion rather than the correct figure of £5.8 billion. “Purchases by UK monetary financial institutions and other UK private sector holders will be updated accordingly,” it added. Speaking to RT on Thursday, UK economist Michael Burke said the blunder was embarrassing for the bank. He also noted the mistake lay undiscovered for a long period. “It is also embarrassing for City pundits who made grand statements at the time that this inflow of overseas investment supported the credibility of government policy. It didn't happen and it doesn't,” he said. “In fact, the IMF reckons the deficit on this measure was 4.2 percent of GDP in 2014, not much changed from the period of the financial crisis in 2008,” he added. In January, Bank of England governor Mark Carney’s claim that Britain had escaped a “debt trap” common to Eurozone states was dismissed by British economists. Speaking to RT at the time, Burke said Carney’s claim was “delusional.” He stressed British consumers are borrowing more than ever, the British government is “also borrowing more from abroad,” and that these inflated “bubbles of borrowing” are destined to burst. 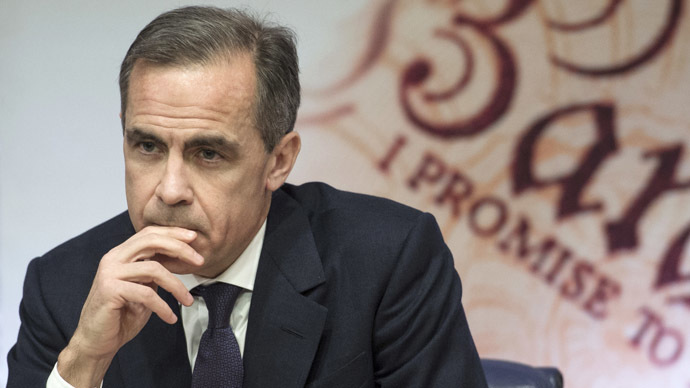 The BoE’s inaccurate figures for March, which were estimated in the wake of the European Central Bank’s (ECB) recent bond-buying scheme, calmed fears in the City and beyond of a pre-electoral debt strike. Analysts have long warned that the UK’s budgetary and current account deficits, each of which hit roughly 5 percent of gross domestic product (GDP), pose a considerable threat to Britain’s economy. The extent to which the BoE's announcement will impact on the UK's economic recovery remains unclear. Nevertheless, market analysts, investors and City punters are watching developments closely. The BoE also previously warned the state’s current account deficit – which charts the gap between cash flowing out of Britain and cashing flowing in – was large. It said this heavy debt burden could potentially “trigger a deterioration in market sentiment towards the United Kingdom” if Britain’s economy deteriorated. The European Central Bank’s quantitative easing program amounts to €60 billion per month. It expected to attract higher inflows of capital into Britain, as investors look for fresh sources of profit.